This is our first review of Ring of Honor for this blog and I have to admit I haven’t managed to catch up with Ring of Honor for some time so I was a bit out of the loop in terms of storyline. However what did surprise was how easy it was to jump in, with Nigel McGuiness and Kevin Kelly doing an excellent job on commentary explaining what was going into each match and story. Now any who’s watched any Ring of Honor over its rich eleven year history will know that the American Wolves and The Briscoe Brothers are two of the best tag teams the promotion has ever seen. 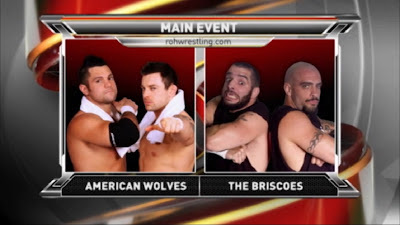 With a lot of a history between not only the two teams, but the tag partners themselves, including numerous World Title match between Wolves’ Davey Richards and Eddie Edwards. We now had an added factor to this match, with Best in the World just two weeks away, where older brother Jay Briscoe will defend his ROH World Championship against little brother Mark, how would the Briscoe’s work together in this match? The match built up slowly throughout, starting with some good quality grappling between Eddie Edwards and Mark Briscoe and going from there. With both teams having control of the match for periods and both getting in some interesting double team manoeuvres and reversals kept the match running at a fast pace. There was a fantastic section where the momentum switches for both teams were so quick it was difficult to keep track of who was in control until a beautiful arm bar transition from Davey Richards was broken up with a Froggy Bow from Mark Briscoe. The ending came when Davey ducked a punch from Mark who inadvertently hit his brother. With Jay out of the equation, Richards got Mark in a Tombstone Piledriver position, with Edwards delivering a swift kick to the head, followed up by the Piledriver for the win. It was a good ending to a fantastic television contest, it would have been nice to see these two teams go at it for a little longer but with Pay-Per-View contests to build up it’s understandable they went for this ending. With the Briscoe’s costing each other the victory in this contest, it will be interesting to see how this plays out in their contest at Best in the World. In order from them both to stay high up the Ring of Honor card prior to the pay-per-view it would be expected that one of them will have to turn on the other during or after the bout, or at least develop some bitterness to continue the rivalry, similar to what happened last year between The American Wolves. The SCUM storyline continued this week with Steve Corino coming out with Jimmy Jacobs, Cliff Compton and Rhett Titus. Corino cut a good promo on Nigel McGuiness, claiming McGuiness deliberately left Jacobs, Compton and Corino out of Number One Contenders matches last week. McGuiness left the commentary desk and got in ring, being joined by Jay Lethal and C&C Wrestlefactory. With Corino still spouting McGuiness kept quiet instead just continuing to stare out Corino whilst the SCUM and ROH competitors went toe to toe in the ring. It was good idea to keep McGuiness quiet as it showed he’d rather let the actions of his team speak and built the numerous match between the two at Best in the World well. Whilst the three biggest companies in the USA all have major factions dominating their storylines at the moment, SCUM is closer in comparision to Aces and Eights in TNA, than it is to WWE’s The Shield. Whilst TNA on numerous occasion has made Aces and Eights look weak against it’s guys, ROH has kept SCUM looking strong, even after losing former leader Kevin Steen. Therefore, once SCUM get inevitably defeated by the Ring of Honor faithful, either at Best in the World or later on, it will be a much bigger deal and help elevate their opponent going forward. The ROH World Television Champion, Matt Taven was also in action. Taven’s manager Truth Martini, flanked by the Hoopla Hotties, offered up an open challenge to the lockeroom for a Proving Ground match with Taven. The challenge was answer by Pepper Parks. Parks hasn’t been seen on ROH TV before, but McGuiness and Kelly did a good job of building him up on commentary, as well as a nice pre-match promo from Parks. It was a decent match between these two, but it felt like it could have been a lot better with neither man really hitting top gear throughout the match. Taven picked up the victory with an interesting and dangerous looking varations of the DDT. It did it’s job of building Taven further into his Best in the World title defense against Jay Lethal and Jimmy Jacobs. Tommaso Ciampa had his in-ring return against a debuting Rip Impact. The result of the match was obvious and this was pretty much a squash as Ciampa dominated. Impact did get a surprising amount of offence in, managing to reverse a Project Ciampa attempt. Ciampa sent a message to his Best in the World opponent Michael Elgin by holding a vertical suplex for a good time, which drew out Elgin to ringside. With Elgin’s distraction giving Impact the upperhand, Rip headed for the top rope, only to be met with a devastating knee to the head from Ciampa, who finished off the match with an Air Raid Crash for the second rope. Not a particularly memorable contest but allowed the Ciampa and Elgin rivalry to develop in what could be a fascinating story between the two power houses. Elgin continued to put over the rivalry in an intense backstage promo for Inside ROH later in the night. Inside ROH also featured good promos from Kevin Steen and Adam Cole. Steen built his rivalry with Matt Hardy in a fascinating interview, where the hatred Steen has for Hardy came across well, finishing by saying he would remove the cancer from ROH, that cancer being Matt Hardy. Adam Cole has been teasing a heel turn since his Border Wars match with Jay Briscoe and this looks like it’s about to happen. A new look Cole, revealed he’d realised all that matters any more is wins and losses, as well as putting over his Best in the World opponent Roderick Strong. What have we learnt from this weeks ROH on Sinclair? 1. American Wolves and Briscoe Brothers have been surprisingly overlooked by bigger companies. 2. Steve Corino has found a great role in the leader of SCUM. 3. Nigel McGuiness and Kevin Kelly are probably the best commentary pairing in wrestling today.